The U.S. dairy industry continues to consolidate. 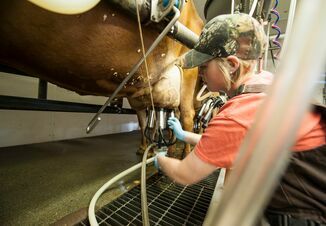 A greater proportion of milk is produced in dairy farms with more than 500 cows, even in more traditional states in the Midwest and Northeast. In 2012, 50% of milk came from those herds in New York, 33% in Minnesota, 38% in Wisconsin, 75% in South Dakota and 58% in Michigan compared with 16%, 8.5%, 9%, 26% and 20% in 2000, respectively (USDA Census of Agriculture). 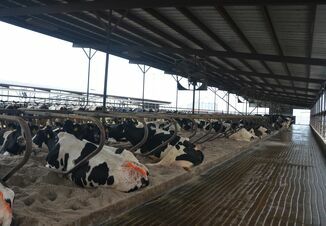 This rapid shift appears to be the trend for the future, which means that cows are housed in larger groups, making it more difficult to observe the individual animal. These operations are more labor efficient, but the question is whether there is enough time available per individual animal. A continuous attention to the individual cow is important for improving and maintaining good animal welfare. Good animal welfare is a societal requirement, and therefore needed for market access; and, of course, it is the right thing to do. Individual cow sensors that can measure their temperature, activity, resting time, rumination time, feeding behavior and more. Voluntary robotic milking systems that automatically milk cows and feed them grain while recording lots of information about the animal. Automated calf feeders that feed milk or milk replacer to young calves and measure their feeding behavior at the same time. When would be the most important time to observe cows to make sure their health is not negatively affected and that their well-being is improved? Cows are more at risk for diseases during the transition period from late gestation to early lactation due to the various hormonal and immune system changes taking place during that time. The use of individual cow sensors during the transition period can be a valuable tool to predict cows at risk for transition health disorders, so appropriate care is given to those animals as needed. These data can also be used to evaluate the overall transition management on the dairy farm. Cows that are more susceptible to stresses in their environment will be sentinels to alert producers to the need to improve housing, handling, nutrition, feeding management, grouping and so on. In conclusion, new technologies available, or being developed by various companies in the dairy industry, are helping us improve the welfare of individual animals in our dairy farms.